When we went to Montauk on Valentine’s Day, we of course had to make the obligatory stop at a yarn store. 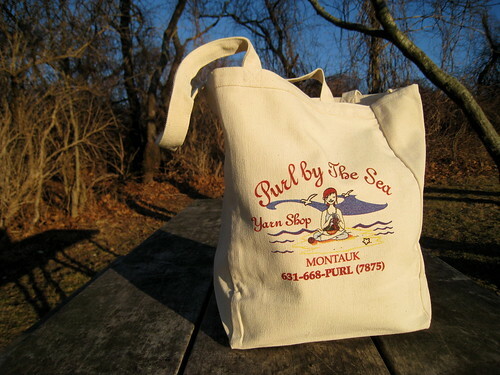 Montauk’s only yarn store (I think) is called Purl By The Sea and was very difficult to find, even though Montauk is super-small. I ended up having to call the owner (Nora Franzetti, also of the real estate shingle there) and she gave us step-by-step directions even though we were literally a block away. Montauk, you are so confusing. Anyway, this is really a very nice store. 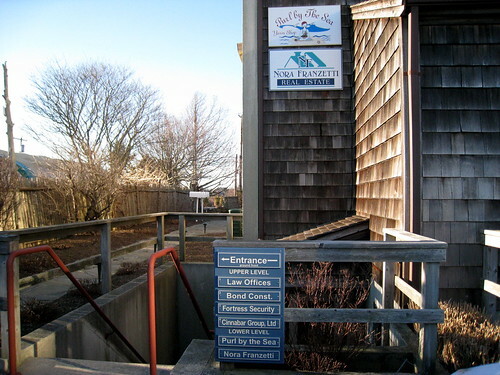 My secret dream is to live in a summer beach town during the winter and be a “townie,” and this store seemed like the local hot spot for the townies in the winter. I was actually surprised they were open, because I assume Montauk does most of their business in the summer, but they were, and all the customers were having a grand old time. I think they were supposed to be having a knitting circle, but it seemed a bit more like a daily catch up. It seemed like a fun neighborhood spot, adding more fuel to my dream of becoming a beach-town townie. It also had an unusually wide range of yarns, price point-wise–this was the only boutique-type store I’ve seen with Red Heart and Lion Brand yarn, which is nice. They actually had a huge selection of everything, including lots of higher-end brands, all in a snug, cozy space. And they gave me this free bag with purchase! Posted in Uncategorized, Yarn Stores at March 6th, 2009.